A different approach to teaching the water cycle and the carbon cycle might be to compare them to how the Environmental Control and Life Support System, or ECLSS, works on the International Space Station. You can use the DIY Podcast module: Recycling to make the comparison. Recycling on the space station takes its cues from Mother Nature herself. Like Earth, the space station has a series of systems that come together to make life possible. Even though two-thirds of Earth is covered in water, that amount would have been depleted long ago if it weren’t for nature’s water cycle. The station began with a clean supply of water on board for its crew. Then, like on Earth, the water is recycled to use again. Trees, plants and phytoplankton on Earth recycle carbon dioxide and oxygen through the carbon cycle. The station’s ECLSS has a Carbon Dioxide Removal Assembly and an Oxygen Generation System to supply its inhabitants with air to breathe. Students can build podcast episodes or other multimedia projects about Earth’s cycles using the resources in the Recycling module. 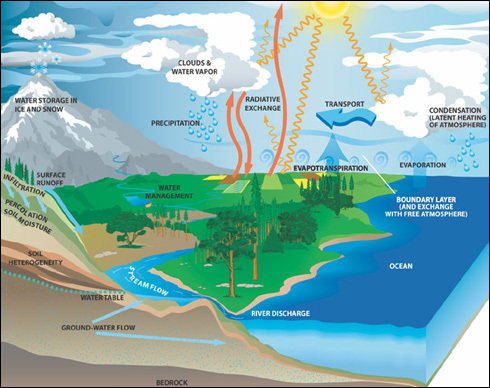 The resources include a water cycle video, a video of the ECLSS water cycle and a carbon cycle illustration. Great information! Thank you very much.